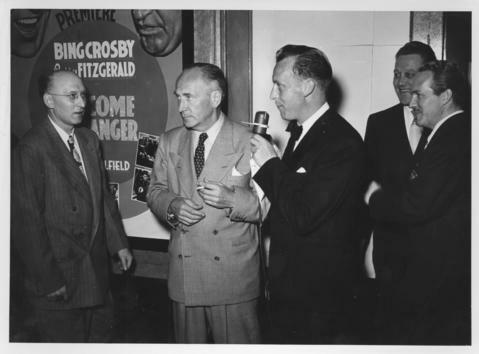 Photograph shows actor William Demarest (second from left), CKRC announcer Jack Wells (holding microphone) and three other men at movie premiere of "Welcome Stranger," at Winnipeg's Capitol Theatre. - Stamp (on verso): By Harold K. White Studio, 274 Fort St. Winnipeg - Phone 94289. Related newspaper clipping on file.